Guilty Displeasures: The hysterical Joker: Batman is a hobo? The hysterical Joker: Batman is a hobo? Wow. I shouldn't be surprised any more, but it seems that every Joker picture for this new movie is worse than the pictures that preceded it. The same complaints apply, so I won't aim to repeat myself: if you want to read my old objections, you can find them here. What's funny, though, is that I was only just complaining about where they've gone wrong with this interpretation of the Joker to someone last night. I noted that one of my favorite interpretations of the Joker is as a sort of hyper-hysteric - sort of what Morrison attempted in Arkham Asylum, though perhaps not so literally. Think of it this way: The Joker's personality is less a declaration - "I'm really crazy!" - and more a question in the form of a demand - "I'm really crazy: tell me who I am!" That he's presented in the comics as a flamboyant, arbitrarily homicidal, and fantastically neurotic crime boss is meant to say more about Batman than the Joker, as such - that hysterical demand is made of Batman, in particular, and so the Joker reflects (and inverts) the crime-fighting Batman's own neuroses, disciplined violence, and repression. Given that Heath Ledger's Joker looks like something of a tramp or an out-of-work clown, I can only guess that Christian Bale's Batman will be a hobo-detective. Maybe he'll trade in his utility belt for a bindle? I linked here from Geoff's post: I dont see this as hobo, but punk. In this sense, we might get an interesting take on the anarchy vs order binary. And take another look at Dave McKean's very disorderly looking Joker-- the cracked, scarred-looking eyes and the wrinkly trenchcoat. This is not a pristine dandy. I can't see punk here - the aesthetic is wrong. Punk doesn't do jacket, vest, and tie - even if it's dirty, even in green and purple. Goth, maybe - but goth and punk are really not all that much alike. And I think that the anarchy/order conflict is overdone and just too obvious with Batman and Joker. Far more interesting, I think, to play it as pathological order versus pathological order - with complimentary but incongruent pathologies, naturally. True but i dont know many hobos who wear flamboyant 3 piece suits, with scarification. I think this is very much inside the mod/punk nexus of Vivenne Westwood. But i completely agree with your comment about competing pathologies, which i think is very much a possibility. all of these Christopher Nolan movies are about some pathology, and this one will certainly involve clashing obsessives. Dont dismiss it just yet! Well, this Joker interpretation is obviously more realistic. An insane person is usually unkempt and is rarely, if ever flamboyant in the way the comics represent them. The character of the Joker is supposed to be insane and not funny, but a parody of a clown al'ah John Wayne Gacy. I suppose you think yourself a "purest" to the older Joker interpretations; they struck me as slightly homosexual.. rather than parodies of evil clowns..
anonymous: It isn't really fair to group all 'insane people' in such a way - there are plenty of highly functional people with mental illness. (You know - the cliché of hearing the neighbors of the serial killer explain that 'they were so normal' or 'just like everyone else'.) And if the Joker isn't exactly 'realistic', well, he shouldn't be - evil clowns are not terribly realistic in the first place, and the Joker is supposed to seem exceptional, not typical. And 'slightly homosexual' is part of the subtext to the Joker. He's threatening not simply as a destructive physical and psychological force, but as a sexual one as well. Or at least his least tedious and obvious iterations are. The movie is out. Most people agree, Heath Ledger was great. This Joke was awesome. You are a moron. moron: And you, evidently, can't read. I'm not quite sure what argument you think you're having, but you're clearly only having it with yourself, so I'm just gonna ignore the rest of your comments. Punk, cool or what ever adjective anyone can think up; bottom line is Ledger brought a demension to The Joker never to be out done. DC Comics should retire the Joker. This is to be the early stages of the Joker. He is a non-comformist that fabricates his own clothing. His plan of anarchy is for his own amusement and thumbing his nose at the status quo. In later stages, he will become full of himself and take his showmanship to a Liberace-esque level (ie: Nicholson Joker). The escalation is that of irony and self-entertainment. This Joker was perfect in every sense of the word. All I see here is a lot of pantie-wastes feeling inadequate against a true psychopath. Grow a set. padlock: I can't even begin to understand what you're responding to or what that comment even means. I realized that the new movie was going to attract new people to the blog, but I generally like it when people try to substantiate their points. If they have a point, that is. I agree that the Joker that Ledger portrayed (visually) is not the same. In fact, it's almost opposite. But I can't really picture him without that smeared, creepy, grunge look now. I've been a Batman fan for over 20 years and up until yesterday I had pretty much the same impression judging from the pictures alone. However, after seeing the film, I understand that this new interpretation is perfectly suited for the film. It was time to update the joker to better reflect today's social climate and they did a great job with it. When you see the movie, if you haven't already, I think you'll find yourself coming away from it saying, "Now that was the Joker!" the joker was depicted perfectly in the movie i believe. the makeup and the suit helped the character. there was nothign wrong with the way the driectors presented him at all. i'm gonna have to disagree heaviy with this as the character was simply perfect. jerry, b167...: You're responding to posts I wrote in December, when only 3 photos had been released, and my opinion of Ledger's character and performance are far kinder than my initial reaction to some pictures. Try reading the review that I wrote a few days ago. The pictures that they released before did seem to lead the Joker to be some sort of something that needed to clean up his act. It displayed a some what scraggy character that I feel (or rather felt then) was out of place. But after seeing the movie, I found the Joker to easily become my favorite character in the movie and see why the director was going with the look he he did. It brought alot to the film and know when I look back on the Joker depicted in the comics, I feel he is the one out of place rather then the new updated version. For these resons I think it can be said that neilshyminsky's view was reaonable and I understand it. ya know... I feel as though Mr. Neil's assesment (more than 7 months ago) was an accurate one. Based on the early release of photos it left lots to the imagination... and even assumption that the charector would be quite flawed. I remember the first announcement from well over a year and a half ago that Heath Ledger would play the joker and expected it to be a joke (no pun intended). This version of the joker was motivated purely by the freak show. It wasn't the money, or the notariaty... just the freak show. I thought that was brilliant and a true dipiction of someone neurotic. There was something remarkably subversive and unintentional about his charector! The irony of the whole thing is that the innitial release of the joker pictures and even the thoughts of his charector was a quite opposite of the delivery itself. I feel as though that was part of the game. I'm not so sure that they wanted the public to see this new sinister creepy version for fear of premature assumptions. It truly was a surprise and quite a freak show indeed. I LOVED IT! But Aquaman! You cannot marry a woman without gills! You're from two different worlds! Oh God! I've wasted my life. the early comments in the blog were based in pictures. making an statement based in few images is risky, and usually, wrong. We all agree on the fact the Joker was simply amazing. the character gets dirtier, messier and darker through the movie, and the city decays with him. he doesnt have a history, doesnt have an intro... he is just the Joker. and what a Joker... i always thought the Joker should be like that... somebody who only thinks of destruction has to be self destructive too. i wish i had another thumb to give him 3 thumgs up. i absolutly agree russ! although it's been said heath did research sid vicious for the role, no matter what genre he was trying to be, heath made that movie, hands down. he was perfect. Heath ledger sat in a hotel room alone and wrote thoughts the joker might have thought and practiced sounding they the joker might talk just to get prepared for the role. Just so you know! Try searchin joker or heath ledger on youtube its on one of the videos! damn, could you have been anymore wrong in your initial post? Wow. Gobsmacked at how a more believable portrayal of the joker could spawn such disapproval! See, the beauty of making it believable, is in doing so, you get your audience more involved, by making them fear the villain. Questions, like whether the guy is a true psychopath, or just trying hard to seem like one, plague the mind of the more skeptical viewer when it appears that the villain spends more time applying makeup, and washing his outfit, than working on his grand plan. Heath Ledgers joker is incredible. He is wonderfully intelligent and calculating, and at the same time, maintains complete unreasonability. Previous jokers never seemed so mentally impenetrable. Most importantly, this joker challenges the viewer to look at the darker side of humanity, and indeed, themselves, whilst the relatability of the previous attempts was far too censored, and unbelievable. Again, latest anonymous poster, all of the disapproving responses were to pictures released in December, not the movie itself. Though I object to the suggestion that a believable/realistic portrayal is somehow better simply because it is. Verisimilitude has never really been a desirable standard in superhero movies, and the Joker has never been terribly realistic, either - his pathology is terrifying, I think, precisely because it's unlike anything we're likely to ever see in real life. heath was unbelievable....joker purists may be upset, but who cares. Characters stay interesting by evolving or at least allowing people portraying them to add their own twist, which he did......flawlessly. This type of complete immersion of character rivals the best of the best, hannibal would be proud. It was so believable it was scary. Heath disappeared. 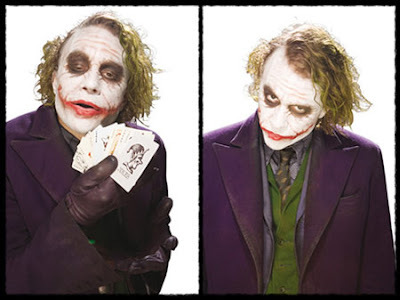 He wasnt playing the joker, he was the joker and now there is one more to add to the list of all-time great villans. ok...Heath Ledger played an AMAZING joker. The joker character is a classic. I think The Dark Knight did THE BEST ever. In this movie the joker was more realistic and had such a different twisted darkness and craziness to him it was awesome. Im such a huge fan. I havent met one person that said anything bad about that version of him. No one has and never will beat Heath Ledger's joker. NOOO FREAKEN WAY. He left us with the greatest performance ever seen. In case you didn't notice, the Joker is *supposed* to look like hell. He doesn't give a damn about himself, and then there's the simple reason that he's insane. And in case you haven't seen The Dark Knight, he's not supposed to be a hilarious idiot like the comics. Again, important note for anyone who stumbles upon this post - it's more than a year old, and it was written BEFORE the first trailer came out, much less the movie itself. If you're interested to see how I revised my opinion of the Joker, just look for my actual discussion of the movie. Geez.